Get your tickets NOW for the 13th Annual GALA! 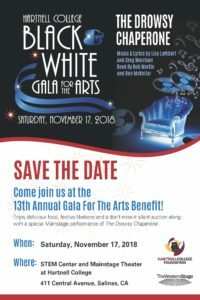 The Hartnell College Black and White Gala for the Arts on Saturday, November 17, 2018. Don’t miss out on a wonderful opportunity to sponsor the most unique event in your community! Your sponsorship is a great way to show your support of the arts. You will be recognized year round in the lobby of The Western Stage as well as have your name displayed prominently at the Gala and on the Silent Auction Brochures. If you would like to learn more about becoming a sponsor for the Hartnell College Gala for the Arts please download the Sponsorship Packet file located below. 2018 Gala Sponsor opportunities are available.